As the Boomsday meta continues to take shape, many interesting decks have begun to emerge. One of them is Tempo Mage. Though not a new archetype, the incredibly fast burn deck did take a back seat for a while during the last meta. Now, thanks to various new tools, it’s back and ready for action. This list has the same core it has always had. You have Mana Wyrm, Aluneth, Sorcerer’s Apprentice, secrets, and ample burn spells. However, what makes this version so different from past ones is that it also comes with a few choice cards that rapidly amp up the tempo it can churn out. Tempo Mage is an aggro deck. Your plan is to push strong early minions onto the board, use them to get in a lot of opening damage, and then end the game with a flurry of burn spells like Fireball and Frostbolt. It is best to get out Mana Wyrm/Sorcerer’s Apprentice/Archeaologist early on and then back them up with Kirin Tor Mage. Once your opponent gets finished dealing with that onslaught, they should be in burn range. Throw damage at their face and you should win. That is not your only route to victory. If things don’t go as planned, or if you don’t have burn, you always have Aluneth to draw through your deck. If the weapon sticks you want to pump out burn as much as possible, throwing your spells at your opponent’s face or using them to protect your threats. You also have a strong spell power package that you can use to pace the board until you draw your engine cards. Ending things quickly is your goal, but it is not the only way to put this one away. You can take your time if it means putting together a flurry of damage. You absolutely need to get going early against aggro, but against control you have more time. Cosmic Anomaly also gives you a lot of extra reach for when you want to save burn. As with so many top Boomsday decks, there are a few additions in this build that help make it much stronger than it once was. The first is the new Mage legendary, Stargazer Luna. Though her ability seems a bit wonky, she can generate a ton of value extremely quickly. Not only are you running a lot of cheap spells (even cheaper with Sorcerer’s Apprentice) but you also are in top deck mode often. Being able to play one card in your hand, draw another, play it, and draw another is the type of gas a tempo deck like this needs. The other new inclusion is the spell damage package. Shooting Star is not much on its own, but in combination with Cosmic Anomaly it is one of the strongest tempo plays in the game. Being able to deal three to three minions is a mini Flamestrike that also puts a must-kill threat on the board. Even if your opponent doesn’t have minions, the two spell power is incredibly strong with cards like Fireball, Arcane Missiles or Cinderstorm. Those few cards may not seem like a lot of power, but they all add on extra tempo and make the entire deck much more consistent. 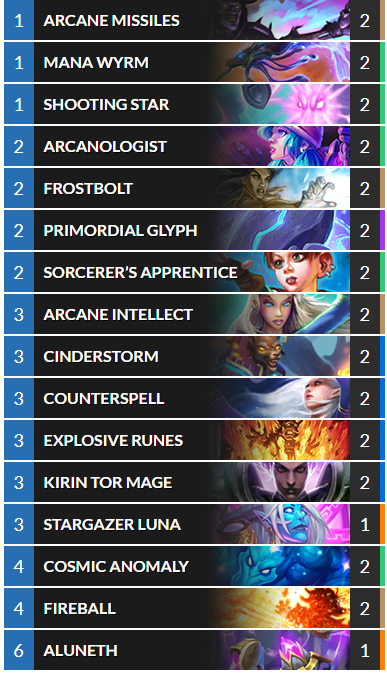 Despite the new tools, the mulligan for Tempo Mage is the same as it has always been. That is to say, you want to aggressively search for your early game. Always look for Mana Wyrm and Arcanologist to kick things off. Sorcerer’s Apprentice is great if you have strong opening spells, and you should keep Primordial Glyph alongside early minions. Kirin Tor Mage/secret is a great keep with an early curve, and you never want secrets in your hand (drawing them is much better). When facing aggro you look for minions first. If you have them, you can then keep Arcane Missiles and Shooting Star. Arcane Intellect is great against slower decks if you have a strong curve. Tempo Mage is one of the older archetypes in Hearthstone, but Boomsday has brought quite a bit of tools to the deck. Things may seem similar on the surface, but the extra spell power package in combination with Stargazer Luna allows you to take on various gameplay styles. That versatility, mixed in with incredibly tempo plays, has given the deck new life. With all the Warlock on ladder, it could be here to stay.